Vector, Ltd., is a national manufacturer of a wide range of entertainment equipment. We are for more than ten years in the market. 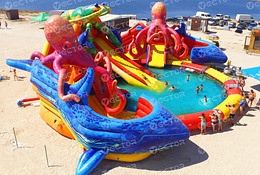 Inflatable water slides, slides with pools, aquatic attractions, water games, water sledges, disco-boats with electric drive, inflatable bouncers, inflatable slides, children’s play complexes, inflatable labyrinths, children’s playgrounds, inflatable pools, playrooms, air-supported structures, air domes, equipment for pools – and it is not nearly full list of the products we manufacture. The main principle of our Company’s activities consists in meeting all the needs of our customers in the maximum possible way. During choice of the product, we discuss all details: model range, color, appearance, place of use and other factors which may influence its design and functions. We develop exclusive models, in which ideas of the customer, those of our designers and, what is the most important, practical experience of our clients are combined. Peculiar pictures and full-color printing on PVC material will form an inimitable artistic view of the products, and elements of company’s style, whether those of your company or those of your sponsor, will attract attention of users. In which way are our inflatable attractions created? Any new product shall pass a long way from idea to implementation. In the stage of development of appearance, design and technical documentation, the up-to-date designing technologies are used. The stage of manufacture is the next one. A high qualification of our specialists, manual assembly and continuous quality monitoring guarantee functionality and reliability of our products. We have mastered advanced technologies of manufacture of inflatable and plastic products, as well as metal structures. Companies engaged in industry of entertainment and services, culture and leisure parks, private beaches, family entertainment centers, sanatoria and children’s recreation camps, private persons. Each customer has his own needs and financial possibilities, and we try to meet all their wishes. The guarantee and after-sale maintenance, services on repair and consulting, flexible system of discounts, advertence to customer’s wishes provide mutually beneficial forms of cooperation with all those who addressed us. The prerequisite of our success consists in efficiency of our activities.